The name Ermanno Wolf-Ferrari is best-known to concert-goers for the overtures to his operas Susanna’s Secret (her secret was that she was a closet cigarette-smoker) and Jewels of the Madonna. But this Venetian composer also produced orchestra, chamber and choral works, rarely performed outside his native Italy, and on March 8 the CBSO gives the UK premiere of his Violin Concerto, composed as a love-letter in 1944, as soloist Francesca Dego tells me. “In 2014 a wonderful Russian Orchestra (the Tatarstan Symphony) asked me to choose and perform a rare Italian concerto, so I started researching different possibilities and was amazed at how much wonderful overlooked symphonic repertoire there is. “When I came across the Wolf-Ferrari and discovered there were almost no available recordings I became very curious. It’s difficult to say why his music virtually disappeared from the concert circuit but it definitely has to do with his nostalgic style, which looks to the past in a period in history when breaking with tradition was mainstream. “The concerto was written in the early 1940s and dedicated to Guila Bustabo (exactly my age at the time) with whom the composer had become infatuated. I think this explains the extremely lyrical and romantic writing, which could also be seen as a sort of psychological escape from the horror of World War II. Italo-American, Francesca Dego recalls her concerto debut, at the age of 7. “It was Bach’s double concerto in San Diego, California, where we were living at the time (my mother’s American). I have an hilarious video of the concert, I had this white-wedding-cake dress and looked tiny next to the other soloist, who was in her teens. Francesca also played the Beethoven Concerto at the age of 14, and the Brahms at 15. Would she change any of these interpretations now? “Of course! I consider every performance a sort of photograph of a specific moment and I think one of the best aspects of growing up with a piece is how it evolves and changes with you in time. I don’t agree with the theory one should wait until 40 to play the Beethoven and Brahms Concerti because to debut such masterpieces at that point would possibly mean being overwhelmed by one’s own expectations. “I may have exaggerated in the other direction but after so many years on stage with these incredible works I feel confident and even more eager to learn from every orchestra and conductor I work with. I have fond memories of those first performances and, listening to recordings of them I’m always amused and a bit envious of how natural everything sounds, albeit definitely naive in many ways. Away from concerto-playing, does Francesca also perform in chamber-music? Francesca is married to Daniele Rustioni, who will conduct this CBSO concert, and who is himself establishing an illustrious international career, including an already impressive portfolio with Welsh National Opera. She tells me about the beneficial spinoffs. “One of the perks of being married to a conductor is that I get to see lots of extra concerts and especially opera performances, which I love and don’t involve me in any professional way, making it carefree and just plain fun. “I’m fascinated by how complex theatre is and how when the quasi-magical mechanism starts to work every little piece of the puzzle fits perfectly. I’ve always felt inspired by singing so listening to opera is wonderful and gives me all sorts of great phrasing and pacing tips. The downside is that when I’m not travelling for my own work I’m travelling for my spouse’s! So it’s very important to know how to be alone and not die of boredom while on the road. 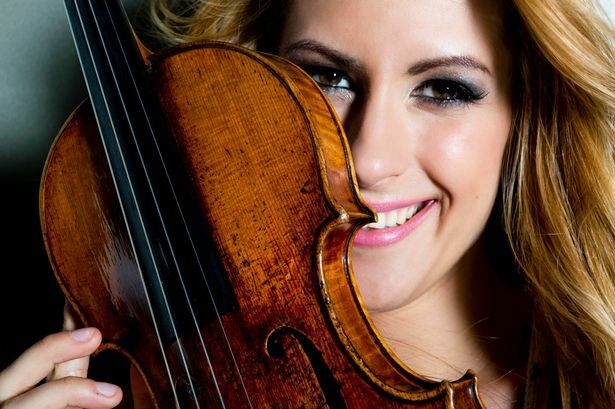 * Francesca Dego performs with the CBSO at Symphony Hall on March 8 (7.30pm). Sunday: Baritone Roderick Williams is joined by accompanist par excellence Iain Burnside for Schubert&apos;s ardent song-cycle Die Schone Mullerin. (Malvern Festival Theatres, 3pm). Sunday: Ex-alumnus Jamie Phillips conducts the CBSO Youth Orchestra in Britten&apos;s Piano Concerto, Steven Osborne the soloist, and Vaughan Williams&apos; London Symphony (Symphony Hall, 7pm). Wednesday: Roddy Williams reappears, this time with the CBSO in a lovely programme of English music conducted by John Wilson (Symphony Hall, 2.15pm).